The Wong Day: Can You Do It? I have recently gone back to school and one of the courses I am taking this semester is centred around the theology of the reformers, specifically that of Luther and Calvin. In class this past week, we were discussing the bound will from Luther’s Heidelberg Disputation, and of course the topic of semi-Pelagianism came up. One of my classmates used an illustration to explain this heresy that is too good not to share with you on on this blog. He pointed out that a semi-Pelagian sees God like the Home Depot store whose tagline is “You can do it, we can help”. That set off a discussion about how pernicious this kind of thinking can be. It is actually fatal because it hides what the real problem is, and prevents us from fully embracing the gospel. To use the Home Depot illustration again, it is like a person who thinks that all they need to make their home presentable is to get a fresh coat of paint, and maybe some new molding, to fix the problems they have with the house. 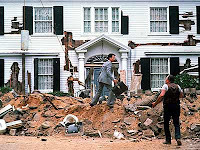 When in reality the root of the problem is that the foundations of the house have rotted away, and it will collapse at any moment (ala Tom Hanks in “The Money Pit”). What is really needed is for the home to be torn down, and a new one erected in its place. That is why the Christian gospel is about death and resurrection—not “you can do it, we can help”! Sin is recognized only through the law. It is apparent that not despair, but rather hope, is preached when we are told that we are sinners. Such preaching concerning sin is a preparation for grace, or it is rather the recognition of sin and faith in such preaching. Yearning for grace wells up when recognition of sin has arisen. A sick person seeks the physician when he recognizes the seriousness of his illness. Therefore one does not give cause for despair or death by telling a sick person about the danger of his illness, but, in effect, one urges him to seek a medical cure. To say that we are nothing and constantly sin when we do the best we can does not mean that we cause people to despair (unless they are fools); rather, we make them concerned about the grace of our Lord Jesus Christ.